Why was I so scared of tackling a quilt? If you sew then I can bet that at some point in your life you’ve dreamed of making a quilt. I’ve been buying fat quarters and saving fabric off cuts for ever in the hopes that one day I’ll have enough time to fulfil my dream, but quilts take lots of time and a specific skill set don’t they? As a working mother time is always in short supply and I know I don’t have the skill set needed to make a quilt, or do I? This week one of my peers became a grandmother, the first of us to be honoured with that title and I realised that my usual new baby gift (a big box of pampers and a case of baby wipes!!) just wasn’t going to cut it this time. I knew that this gift had to be something special, this was worth taking time away from other things and journeying out of my comfort zone to make, after all I’d watched the new baby's father grow up, from first smile, through to his first day of school (skinned knees and all! ), braces, going off to University then to his wedding just 10 short months ago - yes, this gift needed to be special. It was time to face my fears and make my first quilt! 1. I’ve always pictured quilts as hundreds of tiny blocks sewn together and quilted, imagine all the cutting out, and then the piecing together, and you would have to be incredibly accurate in both your cutting and seam allowances or else you will end up with something that just looks poor.. I really didn’t want that. 2. How do I possibly decide fabrics when there are so many to choose from? They need to go together and yet be distinct, there are just too many nice fabrics out there! 3. Then there is the binding for the edge, I hate making bias binding almost as much as I hate sewing it onto the item. 4. Finally you have to do row upon row of accurate, straight quilting. I needed to get over all my stumbling blocks before I could begin to work on this project. I learned long ago that when you are faced with seemingly insurmountable tasks, to tackle them one baby step at a time. I knew the size I wanted, so I cut out the batting - a 36” x 45” rectangle. 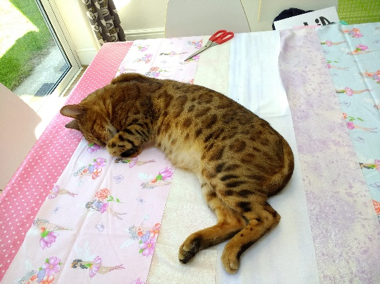 Next up was fabric choices and I thought that was going to be a tough one but fate had other ideas! The postman arrived with my fabric order. 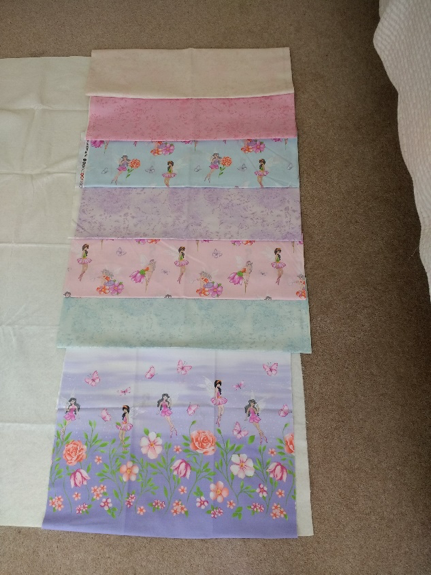 As I excitedly ripped open my blue parcel and pulled out my new arrivals the fabric choice problem evaporated, it was impossible not to notice how beautifully they all went together and how nice they looked as simple strips just laid across the batting. I had chosen the Michael Miller Frolicking Fairies in Mist and Blossom, the Frolicking Fairies double border and the Fairy Frost in Orchid, Cloud and Soft Pink. A strip quilt is a far less daunting project for a novice quilter. Problem no. 2 sorted. 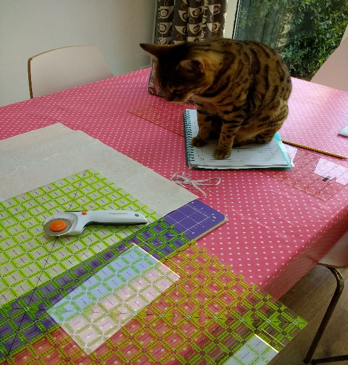 I had an awful lot of supervision as I worked from my 'assistant'! I found the easiest way to cut my strips accurately was using a quilting ruler and rotary cutter, it made things fast and accurate. I cut the length of fabric I needed by the whole width of the fabric. 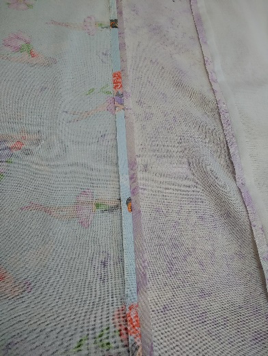 I added half an inch to the length of fabric I needed which allowed me a quarter inch seam allowance on either side of the strip. 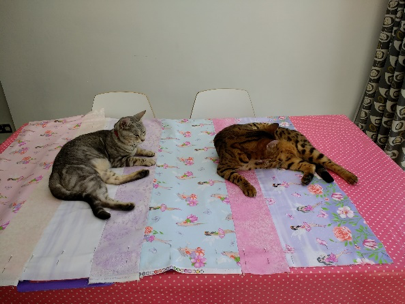 I laid them over my batting rectangle to check I was happy with my layout before sewing. At this point my su”purr”visor had got bored because of lack of attention and decided to test out the comfort of the quilt.. I think she approved!!! One of the good things about this type of quilt is that when you have cut out all the strips you have done most of the work and everything comes together really fast. I stitched all the strips together in order and then pressed the seam allowances open. This was a quick and easy solution to my problem 1. I put the freshly ironed top of my quilt onto the batting, right side facing upwards.. then spent a fair bit of time smoothing it down - with help as you can see! I pinned all around the edge and stitched in place, that way I didn’t have to worry about any of my layers moving around when I added my backing. 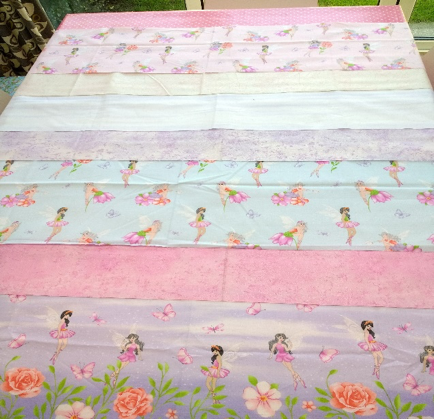 I used a self binding blanket technique to add the backing and the binding in one step, saving time and sorting out problem 3. All that was left to do was the quilting - and I was dreading it! 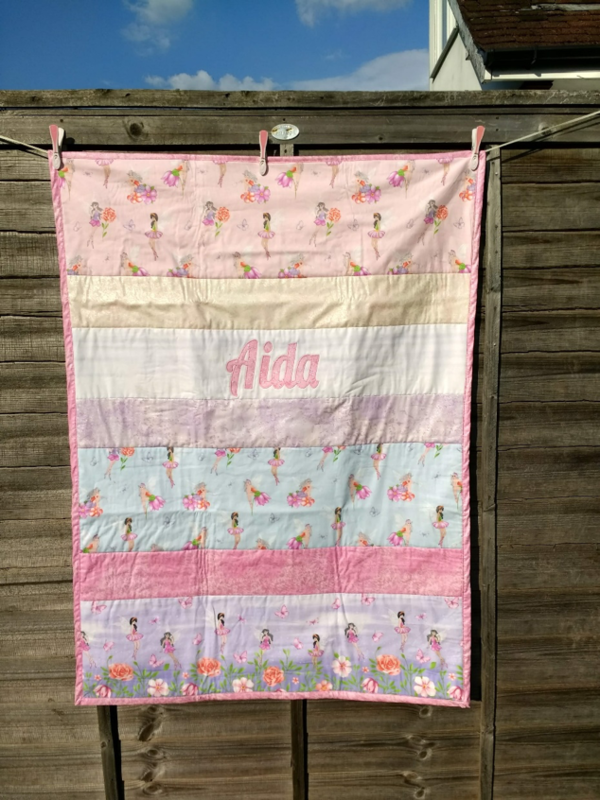 Surprisingly by 'stitching in the ditch' (quilting in your seam lines) problem no 4 was sorted and I was able to complete this project in just one afternoon - not bad for a novice quilter!